I make a batch of deviled eggs every month for my family to enjoy. They make a great quick and on-the-go snack for a busy family or serve them as an appetizer at your next party or get-together. To keep things interesting, I'm always looking for new recipes that offer a little bit of a twist on this classic. Sometimes I'll add a little bit of garlic or guacamole to my egg filling and other times I will just whip them up pretty plain. Today's guest post recipe offers a twist on this favorite American classic with the addition of pepper jack cheese and bacon. The recipe and photo is courtesy of KRUPS. .
Place eggs in KRUPS Egg Cooker, and remove when hard boiled. Remove and rinse under cold water until cool. Place bacon in a skillet and cook on medium until brown and crispy. Crumble bacon and set aside. Peel the cooled eggs and cut in half lengthwise. Remove yolks and place into a small bowl. Mash egg yolks with mayonnaise, mustard, crumbled bacon and cheese. Fill egg white halves with the yolk mixture and sprinkle paprika on the tops of each egg. Add a sprig of parsley to each egg. Refrigerate until ready to serve. 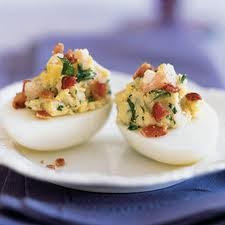 I love the idea of changing the filling in a deviled egg to make it more interesting or just different from the usual one. My family will always appreciate the variety. I have several dozen eggs to use and plan on steaming them in my new Instant Pot Pinning this recipe and need to get bacon!